A beautiful day in Boston depicted in this photo of downtown Boston buildings featuring the Old North Church near Boston Common. While most of Boston can be referred to as historic, this particular area is of historic significance as Boston Common is on of the oldest areas in the city and was once a large pasture, home to cows, sheep and other farm animals. Today, it is a vibrant city park located in the heart of downtown Boston. The Old North Church (pictured at left) was built in the early 1700s and is best known as the church that Paul Revere looked towards before his midnight ride. Revere was looking for a symbol that the British were coming; the symbol being either one lantern or two, hence the famous quote “One if by land, two if by sea,” referring to this particular story about Paul Revere and his midnight ride. Downtown Boston by Joey B. Lax-Salinas is licensed under a Creative Commons Attribution-NonCommercial-NoDerivs 3.0 Unported License. Permissions beyond the scope of this license may be available at http://www.joeyblsphotography.com. Dixfield, Maine is located in the eastern portion of the state along US Route 2, about a three hour drive north of Portland, Maine. This photo shows the town of Dixfield, Maine and the bridge that separates the town from the next town of Mexico, Maine. When looking over the bridge to the north (left), the beautiful Webb River in Maine cascades through rocks forming picturesque whitecaps, then opening to a larger and calmer area on the south end of the bridge. 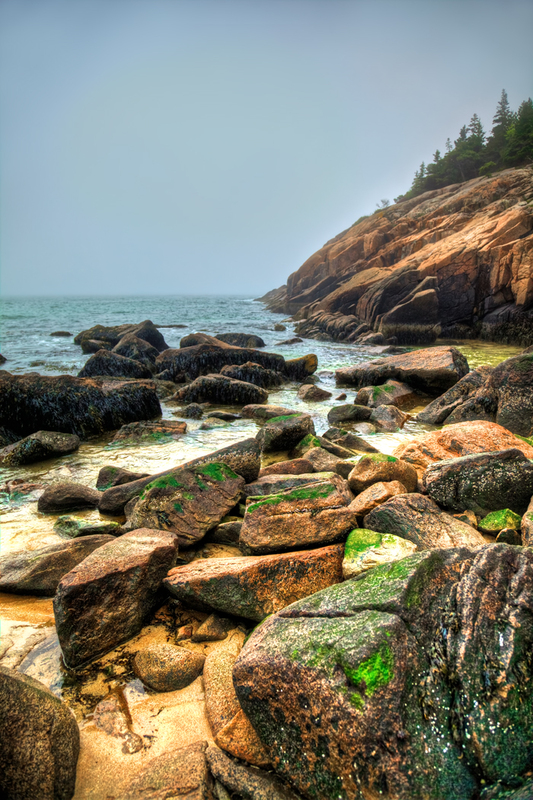 Be sure to check out all of my photos in Maine, including photos taken at Acadia National Park in Bar Harbor, Maine. Dixfield Maine US Route 2 by Joey B. Lax-Salinas is licensed under a Creative Commons Attribution-NonCommercial-NoDerivs 3.0 Unported License. Permissions beyond the scope of this license may be available at http://www.joeyblsphotography.com. 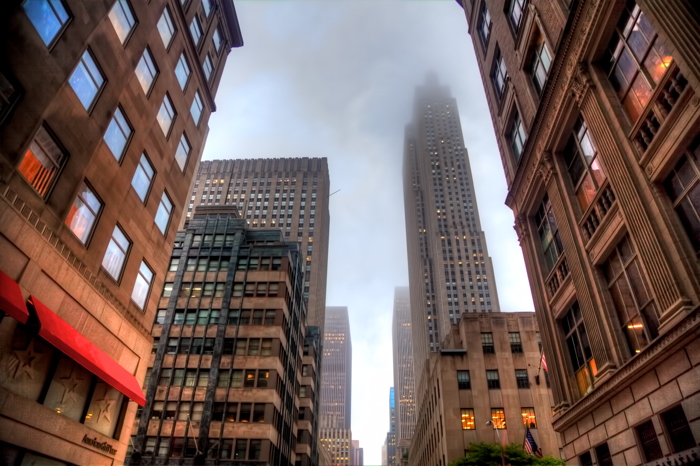 A unique photo of the Empire State Building in New York City as the top pierces the clouds above. The Empire State Building is the second tallest tower in New York City (after the new 1 World Trade Center building in lower Manhattan). The Empire State Building once held the record for the tallest building in the world for over forty years until the World Trade Center North tower surpassed it’s height in 1972. During that year, the World Trade Center South tower would also surpass it’s height and a couple years later, the Sears Tower (now known as the Willis Tower) in Chicago would surpass all three buildings, becoming the world’s tallest building for twenty years after. After the September 11th attacks that decimated the World Trade Center buildings, the Empire State Building moved into the position of being the second tallest building in the United States until the Trump Tower in Chicago passed it’s height in 2008. Empire State Building NYC by Joey B. Lax-Salinas is licensed under a Creative Commons Attribution-NonCommercial-NoDerivs 3.0 Unported License. Permissions beyond the scope of this license may be available at http://www.joeyblsphotography.com. 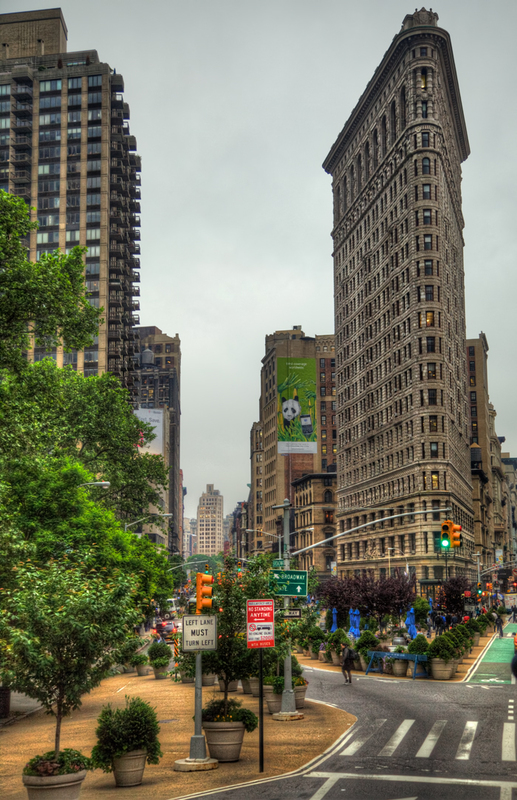 The historic Flatiron building is an iconic symbol of New York City and one of it’s first landmarks. 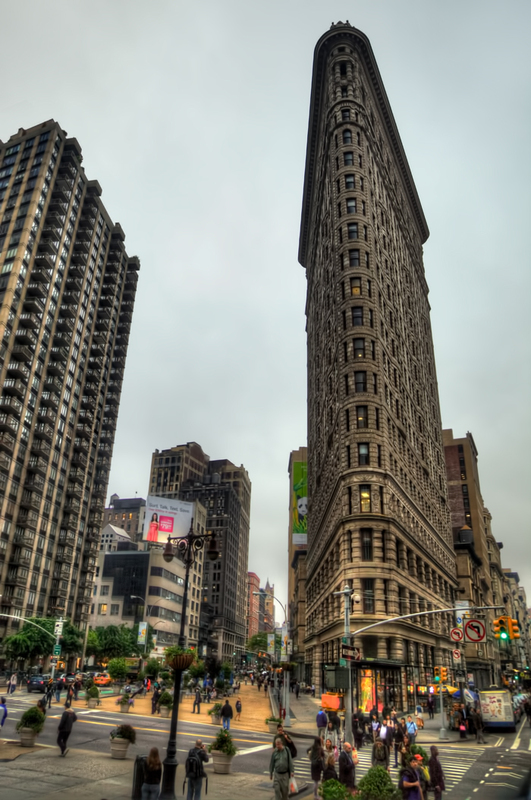 This building makes the shape of a triangle, hence the name Flatiron Building for its flattened shape. It is located in the Flatiron District of New York City in the southern area of Midtown Manhattan. This building has been featured in numerous movies, television shows, photos, posters, documentaries and many other forms of media. It is also one of the most popular buildings to be photographed in New York City. 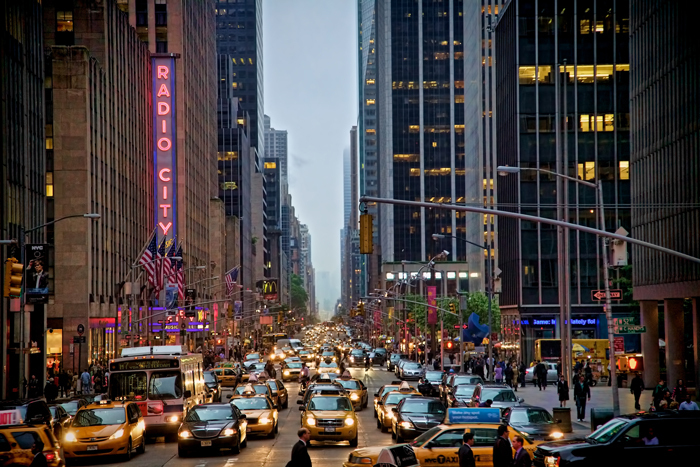 I have several photos of New York City including many from Times Square! Flatiron Building NYC by Joey B. Lax-Salinas is licensed under a Creative Commons Attribution-NonCommercial-NoDerivs 3.0 Unported License. Permissions beyond the scope of this license may be available at http://www.joeyblsphotography.com. The shores of Acadia National Park are beautiful; lined with algae covered rocks, bluffs, trees and every now and then, a little beach. This photo was taken in May 2011 while driving along the scenic loop road through Acadia National Park near Bar Harbor, Maine in the southeastern tip of the park. Check out my collection of photos of Maine, including several others from Acadia National Park. Acadia National Park Rocks by Joey B. Lax-Salinas is licensed under a Creative Commons Attribution-NonCommercial-NoDerivs 3.0 Unported License. Permissions beyond the scope of this license may be available at http://www.joeyblsphotography.com. 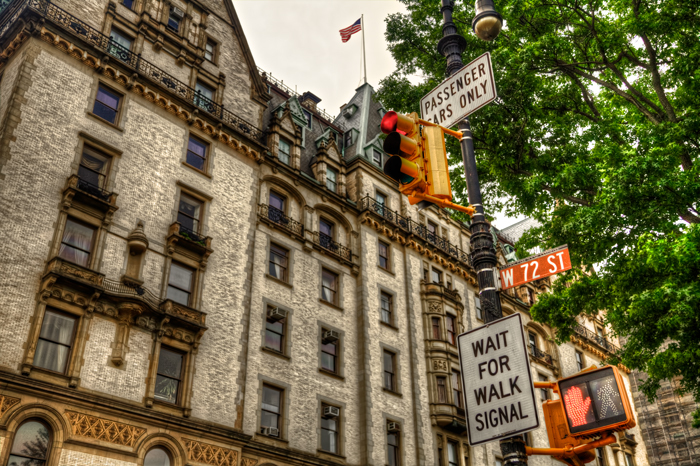 The Dakota is a co-op apartment building located in New York City along Central Park West at W 72 Street across from Central Park. This building is was constructed in the 1880s and at the time, was constructed in a sparsely populated area of New York City that was much further from where the center of the city was considered (near Wall St in lower Manhattan). Today, this building is on some of the most valuable real estate in New York City. The Dakota is square and has a central courtyard in the center. All of the exterior windows that face the street are windows for bedrooms and large family rooms while the windows that face the inner courtyard are for the kitchens and other rooms in the house. 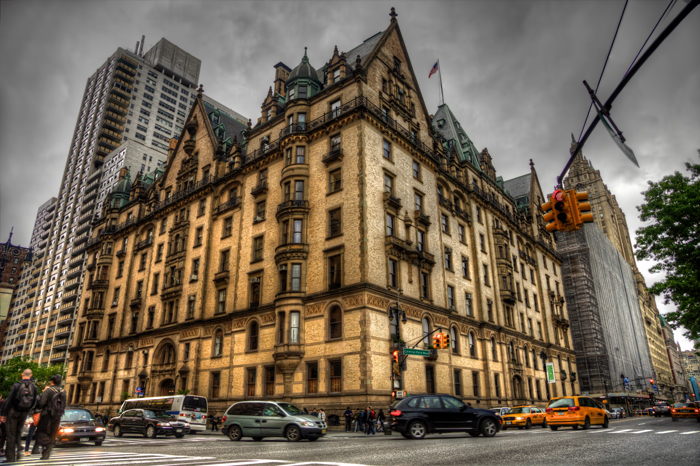 While the Dakota is widely loved by historians and architecture aficionados, it is most famous for being the former home of The Beatles legend John Lennon and wife Yoko Ono as well as being the location of John Lennon’s murder as he returned home with his wife on the night of December 8, 1980. Lennon was shot in the arch entrance (photo below) by Mark David Chapman, who was arrested shortly after. 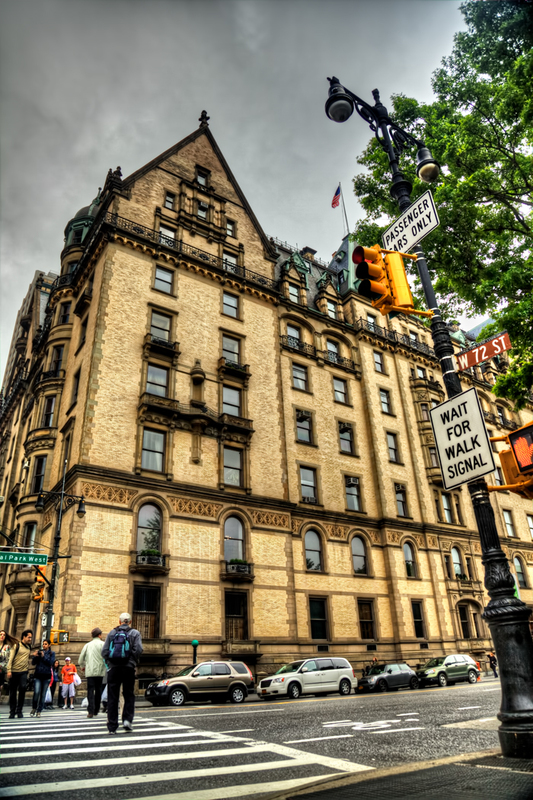 As of 2012, Yoko Ono still owns apartments in The Dakota. 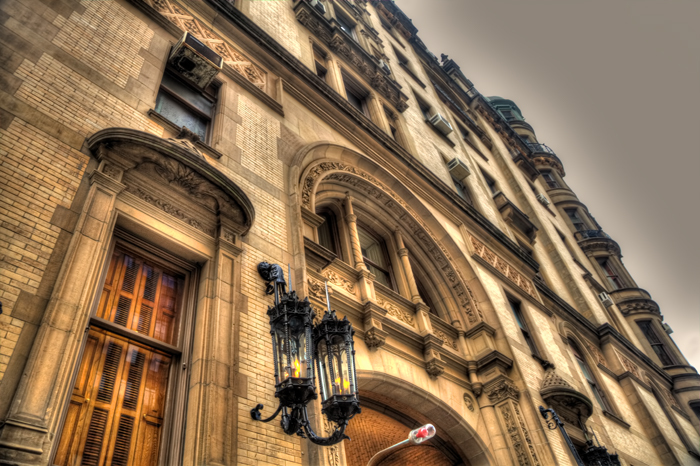 The Dakota in New York City by Joey B. Lax-Salinas is licensed under a Creative Commons Attribution-NonCommercial-NoDerivs 3.0 Unported License. Permissions beyond the scope of this license may be available at http://www.joeyblsphotography.com. The Saranac River in the Adirondacks is a beautiful place to be. This photo was taken in May 2011 while driving from Plattsburgh, NY to Lake Placid, NY along State Road 3. 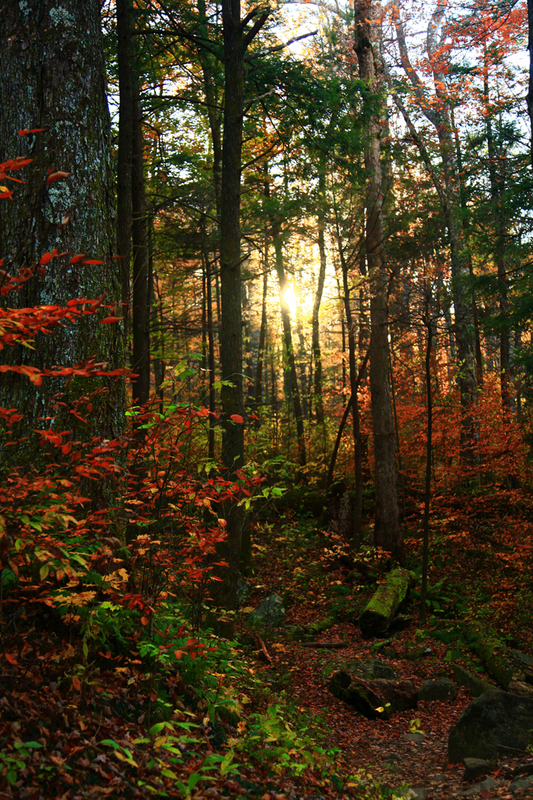 Check out more of my Adirondacks photography here on my website! Adirondacks at Saranac River by Joey B. Lax-Salinas is licensed under a Creative Commons Attribution-NonCommercial-NoDerivs 3.0 Unported License. Permissions beyond the scope of this license may be available at http://www.joeyblsphotography.com. 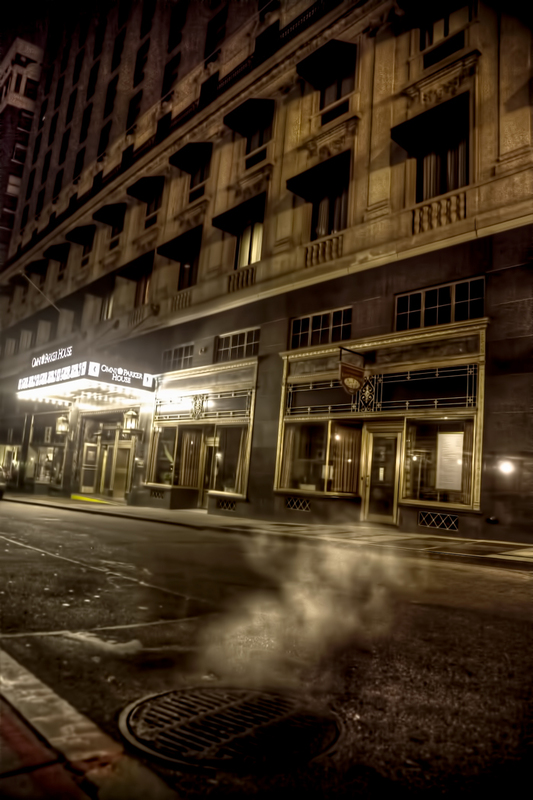 This photo looks like it’s straight from Gotham City, but it’s not…this is the Omni Parker House Hotel in downtown Boston. As I was on my east coast road trip in May 2011, I stayed one night here and took this photo after returning from the original Cheer’s bar and location just under a mile away. The Omni Parker House in Boston was one of the best hotels that I have stayed in while on my road trip. The rooms were roomy, the building’s lobby area has beautiful dark wood panel walls, and it was the most comfortable bed that I slept in during my ten days on the road. The location is perfect if you plan to stay in the immediate downtown Boston area or near Boston Commons and there is plenty to do within walking distance. 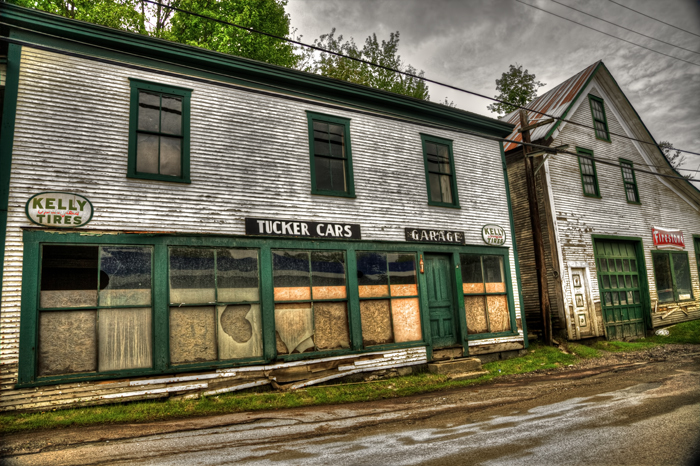 Tucker Cars Garage in Hardwick, Vermont by Joey B. Lax-Salinas is licensed under a Creative Commons Attribution-NonCommercial-NoDerivs 3.0 Unported License. Permissions beyond the scope of this license may be available at http://www.joeyblsphotography.com. I’ve driven through Vermont twice and from a photographer’s standpoint, one thing about Vermont is that you never know what you’ll come across. One minute you might be driving past a beautiful modern home, then a cemetery from the 1800s, then a beautiful ranch followed by abandon and dilapidated buildings along a main state highway. The photo above featuring an old building and closed business billed as “Tucker Cars Garage” was taken on a whim as I drove by. I had my camera in my lap, just snapping away at random things I seen; old gas stations, barns in Vermont and anything else worthy of a shot. I even took a nice photo of an old Vermont house while driving about 40mph. I didn’t think ahead at how I would frame this shot, I just snapped it and this is what I got. Of course, with a little bit of Photoshop love and some tweaks in Aperture and with my Topaz plug-ins, I made a little bit of magic happen and have another storytelling photo to add to my collection. 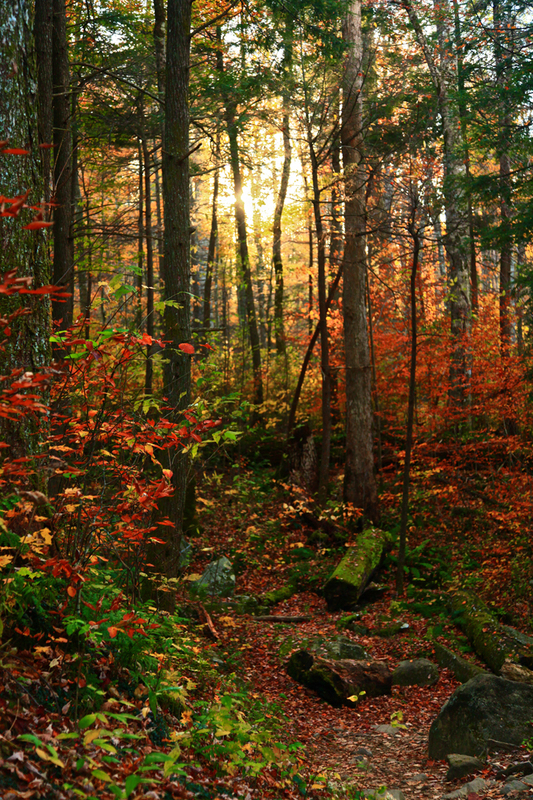 This photo was taken in Hardwick, Vermont. If you look off to the right on the old garage, there is a thin white sign in the storefront window. That sign is an old Continental Tires sign which I was also able to get a good photo of. HDR photo of the Rainbow Bridge in Niagara Falls, Ontario, Canada taken in May 2011. The Rainbow Bridge is the main connection between the United States and Canada and is just a short distance away from the mouth of both the American Falls and the Horseshoe Falls. This is one of my favorite photos from my Niagara Falls collection. Rainbow Bridge Niagara Falls by Joey B. Lax-Salinas is licensed under a Creative Commons Attribution-NonCommercial-NoDerivs 3.0 Unported License. Permissions beyond the scope of this license may be available at http://www.joeyblsphotography.com. 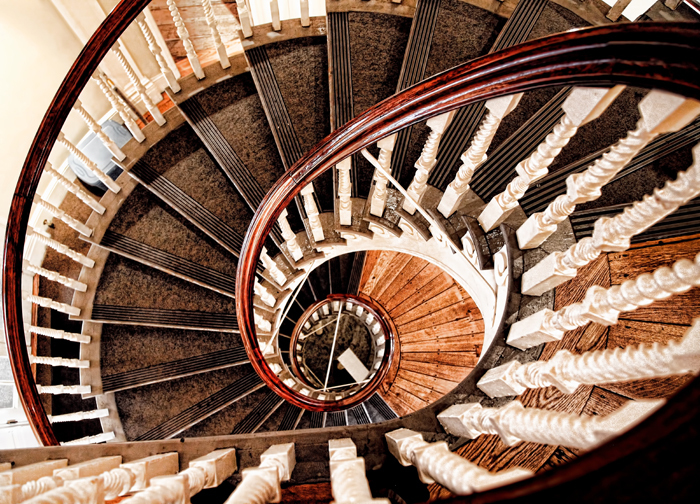 This historic spiral staircase is located in the historic Old State House in the center of downtown Boston, MA. 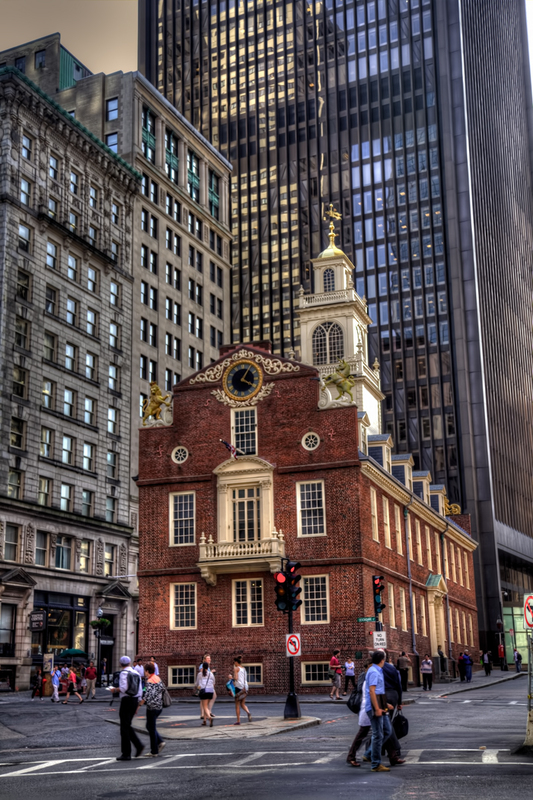 This building is historic for many reasons and is most notable as being depicted in the background of the Paul Revere photo of the Boston Massacre. The Boston Massacre also occurred near the building, which resides an at odd intersection in the city. The Old State House was built in 1713 and was most recently restored in the late 2000s after water damage from Hurricane Wilma in 2005 caused water damage in the building. This historic landmark is one of the most popular stops along the Freedom Trail and today is open to the public as a museum. 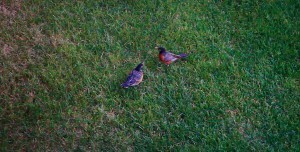 This photo was taken in May 2011 while visiting Boston. I also had the opportunity to take some beautiful photos of downtown Boston on the Charles River in Cambridge. Old State House Spiral Staircase in Boston by Joey B. Lax-Salinas is licensed under a Creative Commons Attribution-NonCommercial-NoDerivs 3.0 Unported License. Permissions beyond the scope of this license may be available at http://www.joeyblsphotography.com. This photo was taken in May 2011 and features Radio City Music Hall in New York City while Rose and I were on our east coast road trip. This particular photo was taken while we were on a double decker bus tour driving through Midtown Manhattan. NYC Street with Radio City Music Hall by Joey B. Lax-Salinas is licensed under a Creative Commons Attribution-NonCommercial-NoDerivs 3.0 Unported License. Permissions beyond the scope of this license may be available at http://www.joeyblsphotography.com. Lake Point Tower (front left) is a residential building located just east of Lake Shore Drive and north of the Chicago River in downtown Chicago. The building is the only residential building that is located on the east side of Lake Shore Drive. Opened in 1968, Lake Point Tower has been home to several celebrities and sports figures, including Chicago Bulls stars Scottie Pippin and B.J. Armstrong, Chicago Cubs stars Ryne Sandberg, Andre Dawson and Sammy Sosa, and many notable celebrities including Goldie Hawn, Richard Gere and many others. Lake Point Tower has unobstructed views of Chicago facing north, east and south and a beautiful skyline view when facing west. At the top of the apartment building is Cite restaurant, a high end french cuisine restaurant with stunning 360 degree views of the skyline and Lake Michigan. Lake Point Tower is located at 505 N. Lake Shore Drive in the Streeterville neighborhood of Chicago and is located adjacent to Navy Pier. Don’t forget to check out my collection of aerial photos taken in the Chicago and Northwest Indiana area! 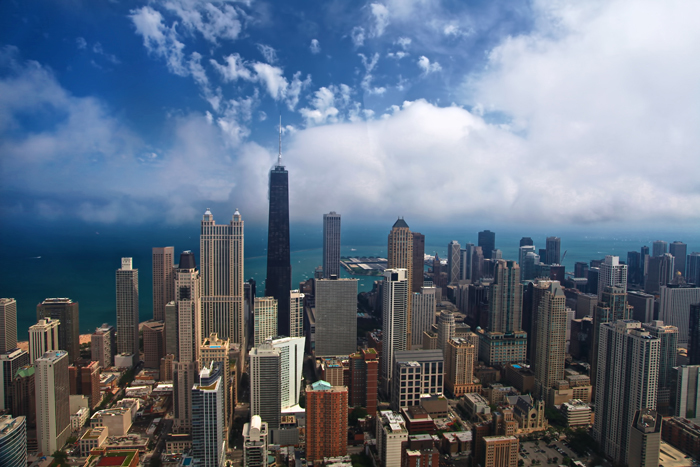 Looking for an aerial photographer in Chicago? Chicago Aerial Photo of Lake Point Tower by Joey B. Lax-Salinas is licensed under a Creative Commons Attribution-NonCommercial-NoDerivs 3.0 Unported License. Permissions beyond the scope of this license may be available at http://www.joeyblsphotography.com. 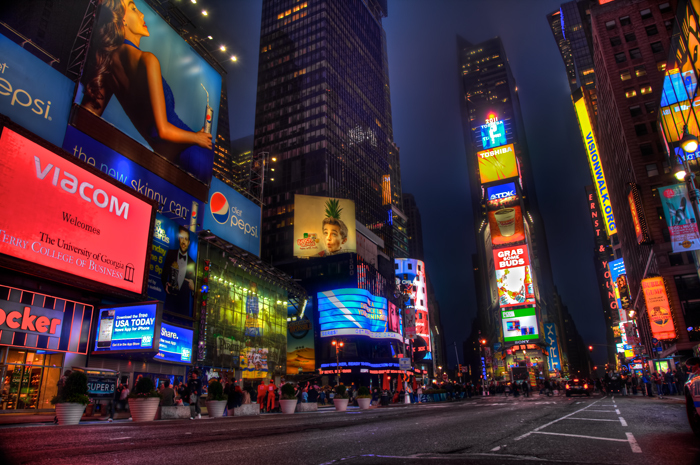 This beautiful HDR photo of Times Square at night was taken while on my second east coast road trip in May 2011. Check out more of my New York City photography photos taken in Times Square, Tribeca and Central Park! NYC Times Square at Night (HDR) by Joey B. Lax-Salinas is licensed under a Creative Commons Attribution-NonCommercial-NoDerivs 3.0 Unported License. Permissions beyond the scope of this license may be available at http://www.joeyblsphotography.com. This is one of the most beautiful fall photographs that I have ever taken. This photo was taken in the Great Smoky Mountains National Park near Gatlinburg, Tennessee near the Roaring Fork Motor Nature Trail not long after hiking the Grotto Falls trail an hour or so earlier. I took this photo just before sunset in late October 2010. 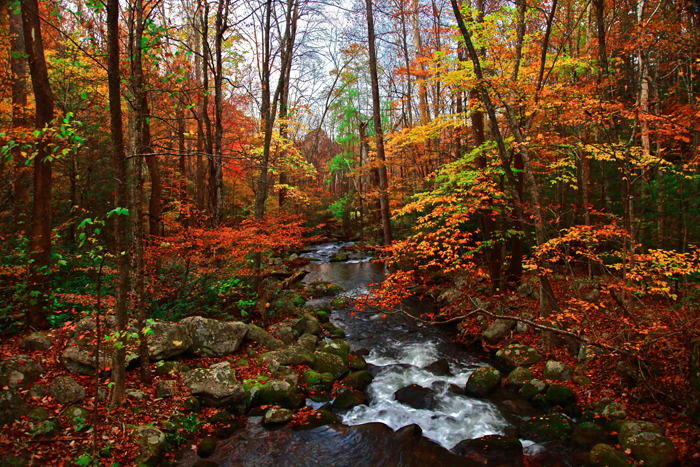 If you have never been to the Great Smoky Mountains National Park in the fall, if you do visit, you’ll notice that the fall season works its way down from the tops of the trees at higher elevations all the way down to the lower elevation levels. Down the road from this location, the colors change back to green and when you climb down into the ravines of the creeks and rivers that flow along the road, the color is much greener and much more like summer than it is in the scene above. I took a beautiful photo of a Smoky Mountains mossy river not long after taking this fall photo and the difference in the color is clearly evident. Smoky Mountains Fall Creek by Joey B. Lax-Salinas is licensed under a Creative Commons Attribution-NonCommercial-NoDerivs 3.0 Unported License. Permissions beyond the scope of this license may be available at http://www.joeyblsphotography.com. I took this photo along the trail that leads to Grotto Falls in the Great Smoky Mountains National Park near Gatlinburg, Tennessee. This trail is not far from the Roaring Fork Motor Nature Trail and is a moderate trail to walk for hikers. The trail leading to Grotto Falls is about 1.5 miles (nearly 3 miles roundtrip) and is easy to navigate. Along the trail, there are four stream crossings which have no bridge access, but it is easy to step on the stones an navigate through or over the rushing streams (the rocks can be slippery!). This photo was taken somewhere in the middle between the Grotto Falls and the trailhead. The photo below is almost the same photo, but the sunset is a bit more centered. I liked them both, so I figured I might at well post both of them! After leaving the trailhead, the drive back was absolutely spectacular. The sun was getting lower in the sky, changing the hues of the tree tops, then lower towards the ground. While taking the one way road back towards Gatlinburg, I pulled over in a parking area and walked across the street where I found a beautiful Smoky Mountains river covered in lush green moss in an area untouched by the autumn lurking above. Smoky Mountains Grotto Falls Trail at Sunset by Joey B. Lax-Salinas is licensed under a Creative Commons Attribution-NonCommercial-NoDerivs 3.0 Unported License. Permissions beyond the scope of this license may be available at http://www.joeyblsphotography.com. 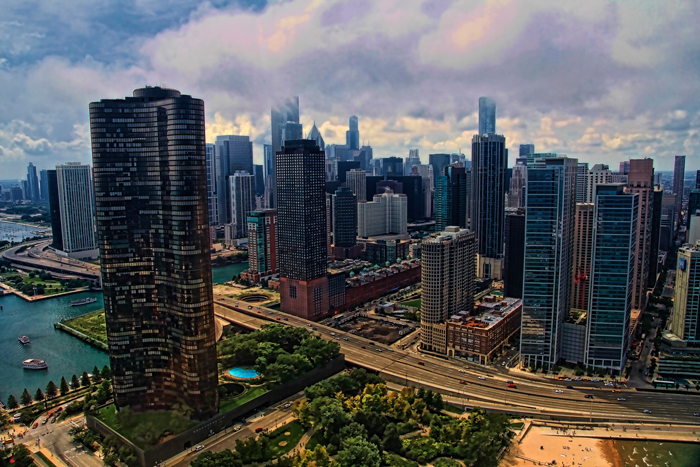 Aerial photographs of downtown Chicago, taken in August 2011. These photos were taken from a helicopter through Sun Aero Helicopters of Lansing, IL. While on this photo shoot I also took aerial video of Chicago just before I started taking photos. Featured in the above photo is the John Hancock building with Lake Michigan as the backdrop. 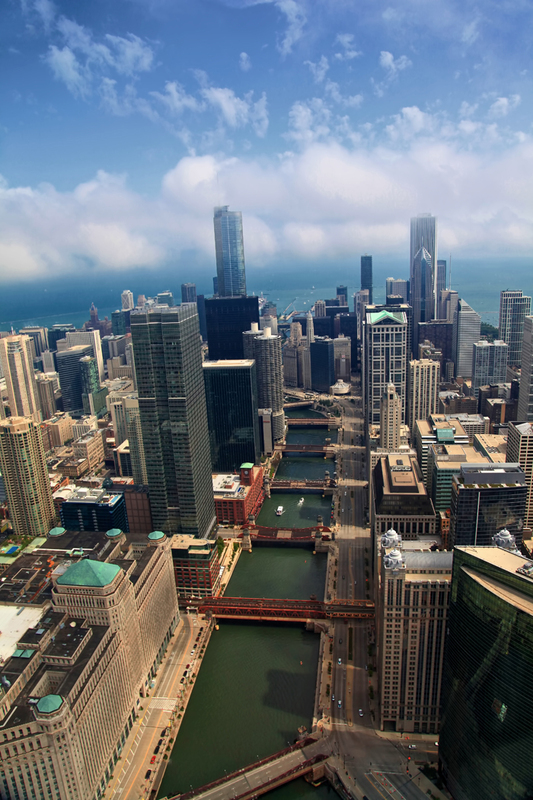 The bottom photo was taken over the Chicago River facing east towards Trump Tower, the Merchandise Mart, Aon Center, Prudential Tower and other prominent downtown Chicago buildings. JoeyBLS Photography provides Chicago aerial photography for the entire Chicago area and all of Northwest Indiana. For more information or to request an aerial photography of your building or property during our next aerial photo shoot, please contact me directly! Aerial Downtown Chicago River and Aerial Downtown Chicago North Loop by Joey B. Lax-Salinas is licensed under a Creative Commons Attribution-NonCommercial-NoDerivs 3.0 Unported License. Permissions beyond the scope of this license may be available at http://www.joeyblsphotography.com. Giuseppe’s Everything Italian in Schererville is an authentic Italian restaurant in Northwest Indiana, located near the AMC Theaters just west of Indianapolis Blvd (US 41). Opened in 2011, Giuseppe’s offers authentic Italian cuisine, with many of it’s core ingredients imported directly from Italy. Giuseppe’s specializes in wood fired brick oven pizzas, pastas, lasagna, and much more! The quaint, comfortable atmosphere inside of Giuseppe’s will keep you running back for more! The food is delicious and I personally recommend the Melanzane & Funghi pizza and their cannolis. Don’t forget to try their homemade gelato too!